The Baltimore Ravens defended M&T Bank Stadium with a 23-16 victory over the Indianapolis Colts. QB Jacoby Brissett went 16-of-33 for 215 yards and a touchdown. RB Frank Gore led the way on the ground for Indy, rushing 17 times from 68 yards and contributed through the air by catching Brissett’s touchdown throw. WR T.Y. Hilton had six receptions for exactly 100 yards. QB Joe Flacco went 29-of-38 for 237 yards and two touchdowns. RB Alex Collins was given plenty of opportunities (18 carries) but only came away with 51 rushing yards. TE Maxx Williams caught his first touchdown of the season, and the second of his career, to put the Ravens up for good. With that, we give you our PFF-exclusive takeaways from the contest for each team. 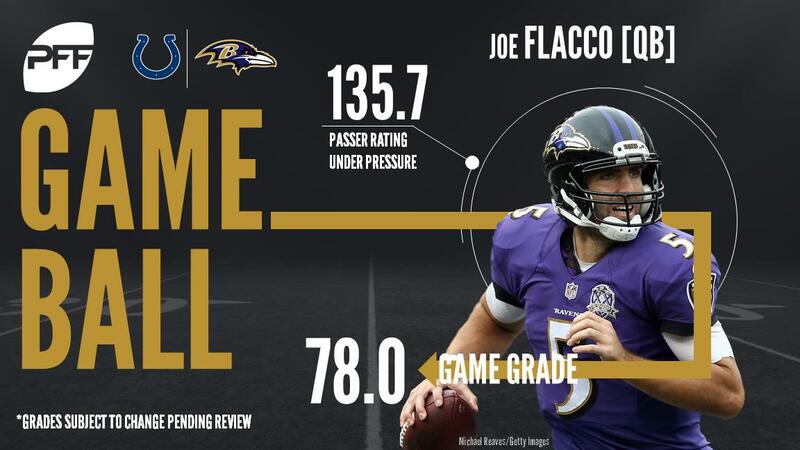 Flacco wasn’t spectacular, but he protected the ball well enough to hold on for the win. He was accurate when he turned the ball loose down the field (5-of-7 on passes 10-plus yards), but often opted for the check down. Skura has often times been a liability at guard in replacement of Marshal Yanda, but he had one of the best games of his young career in this one. He only yielded one pressure on 41 pass-blocking snaps. Canaday allowed one catch on two targets into his coverage and came up with a huge pass breakup to seal the win for the Ravens. Canaday also recorded one stop in this game, his third over the last two weeks. Mosley got sucked up on a play action fake but recovered in time to get his hands on the ball – and nearly came down with an interception he might have had a chance to take back to the end zone – to break up what would have been a big completion to Jack Doyle over the middle. He also led the Ravens defense with four stops, making this his second-consecutive week with at least three stops after failing to reach that mark in Weeks 13 and 14. Brissett was lucky to not have thrown an interception in this one, with multiple balls falling out of defenders hands and hitting the turf. The second-year player also had his struggles under pressure. He only saw pressure on nine of 37 dropbacks but he completed just one of seven pass attempts for a total of nine yards with pressure in his face. Doyle hauled in five of seven targets and earned 28 of his 41 yards after the catch. It wasn’t a huge day on the stat sheet for the tight end but he was certainly valuable, four of his five catches resulted in a first down. Moore was targeted six times on the day and yielded four catches for 40 yards. He broke up a pass and had a crucial third down stop on an early screen to Nick Boyle. Morrison took his lumps in coverage and against the run. He allowed 49 yards in his coverage and was taken off the ball multiple times in the run game.